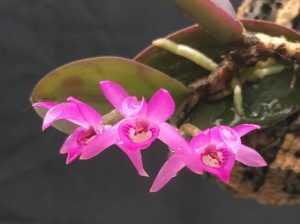 This is a small growing species from the Cattleya family rather sweetly named the three nosed Meiracyllium. The species is native to Mexico and Central America where it grows on trees and rock at around 1000m. 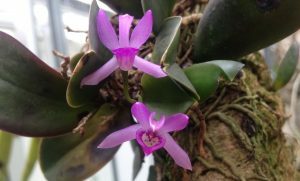 Its habit is to cling tight to its mount and so we would definitely grow it mounted rather than potted and having tried it in a number of sections finds it does best in our Warm Americas section in good light, lots of air movement and spraying daily.